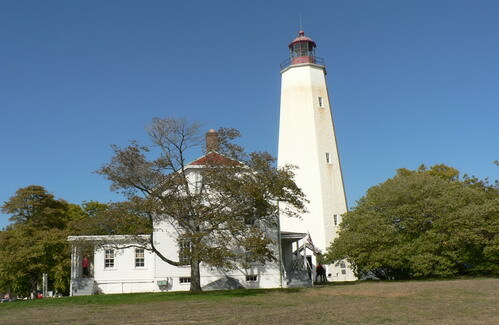 Esther and I decided it was too nice a day this past Sunday for me to watch football all day so we decided to go to some lighthouses as part of the 2010 NJ Lighthouse Challenge. 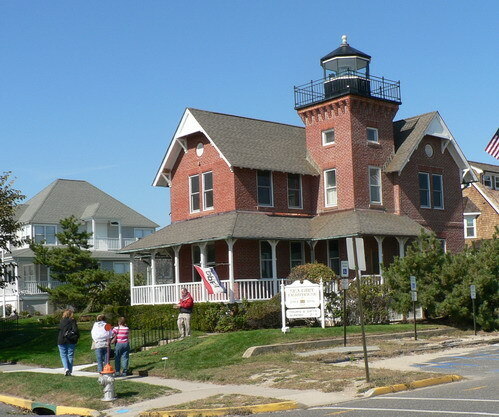 We did not leave Trenton until just after noon so I knew we wouldn't make it to too many og the lights so I opted to start at Sea Girt with the hope of possibly seing Greg (Fitzgerald) there. Unfortunately he had been there on Saturday and had decided to do some Geo-Cacheing on sunday instead. I did get to speak with Conrad, though. I had some dealings with him while helping John setup the bus tour of NJ while at the HL Reunion in Baltimore. 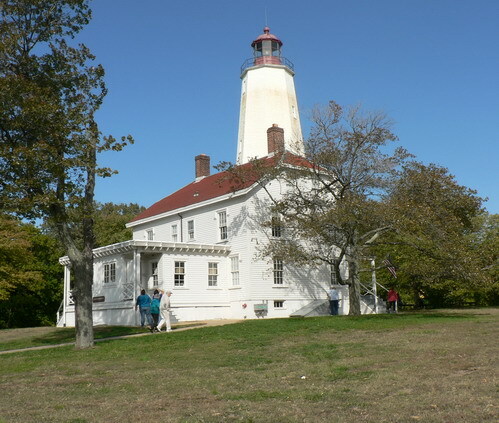 The 2010 version of the NJ Lighthouse Challenge was a bit different- the NJLHS had decided to take a year off when no one stepped up to replace the Co-Coordinators of the Challenge. 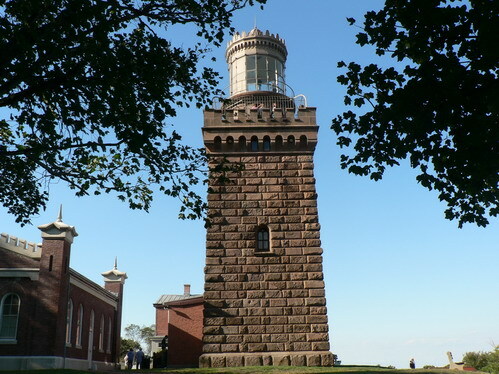 The managers of the NJ lighthouses banded together na dquickly organized a replacement event. 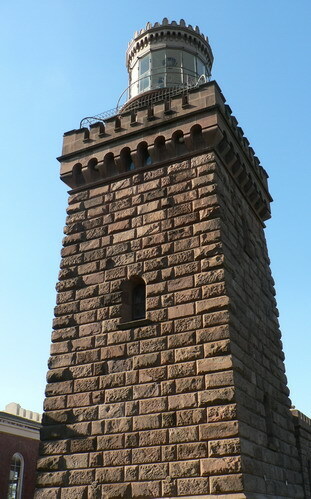 They did a very good job from what I saw at the 3 lighthouses we managed to get to on Sunday. We went inside and toured the lighthouse and spoke a bit with both the lighthouse volunteers and the ladies taking care of the Challenge as well. They indicated that it had been going well with the Challenge - not quite as many as in the past but still a good turnout. 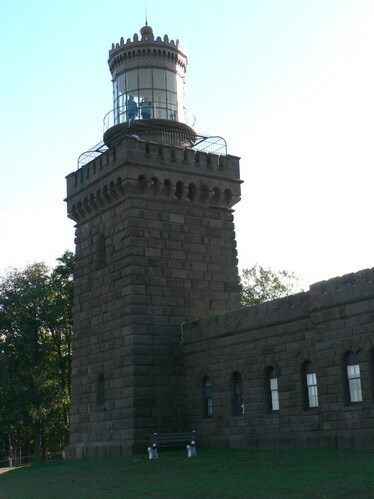 We climbed up to the Tower Room stairs and waited our turn to go up- only 3-4 people fit comfortably at one time. I spent this time talking with Conrad about various topics. 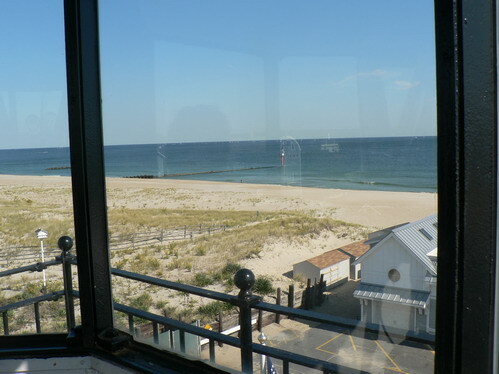 I took some photos of the view from the Lantr room as well. Here's one of them in which you can see one of the ATN. We went back down did some more talking with the volunteers and then went on our way to the next stop- Sandy Hook. We decided to take Rt 71/35 from Sea Girt to Sandy Hook. We made a slight detour on the way as we passed the Stein Mart store my sisre-in-law works at and decided to stop in and see if she was working. She was so we spoke for a bit and then continued on to Sandy Hook. The bridge on Rt 36 over the Navesink River is still under construction- I wouldn't want to be in that area in the height of the summer that's for sure. Luckily there was very little traffic in the area this past Sunday. 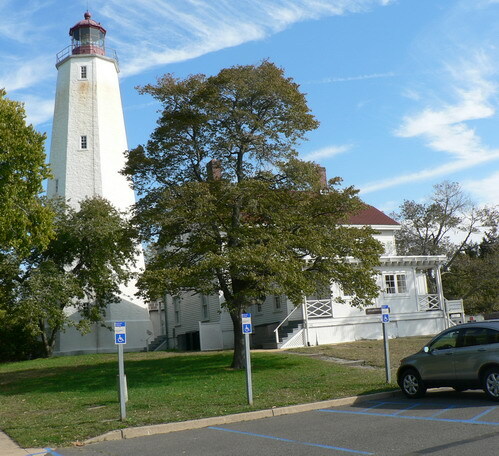 We drove on out to Sandy Hook and walked around outside of the Keeper's house for a bit and took several different views of the lighthouse and Keeper's House. I had to take about 10 shots before I got one with the entire flag visibly unfurled- isn't digital wonderful. We went inside and looked around a bit. I was hoping to be able to buy a 2010 Lighthouse Challenge t-shirt but unfortunately they had already sold out off the large sizes. 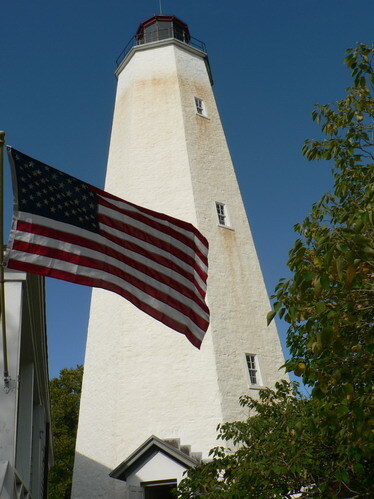 I used to be a volunteer- usually a tour guide - at Sandy Hook but it's been quite sometime since I last did that. I spoke with a couple of ladies in the gift shop area and while I recognized them and at least one did recognize me I don't think either of us knew the others names. 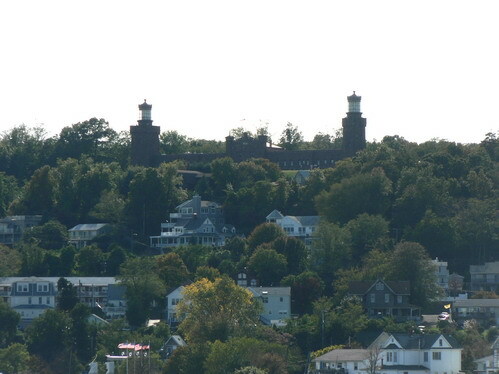 I took this last one from in front of Navesink LH after we got there. 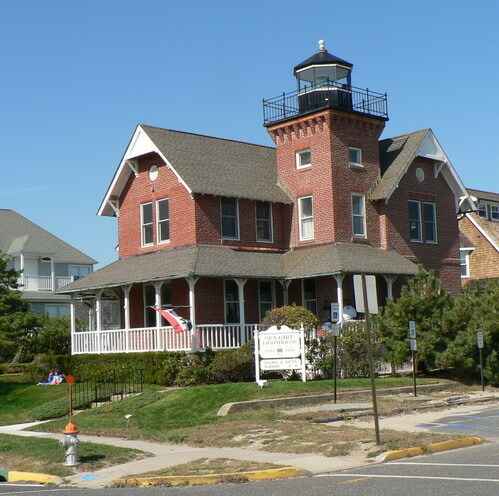 We left Sandy Hook and took that long drive over to Navesink (about 5 miles probably) and stopped along the way to get this photo of the LH. 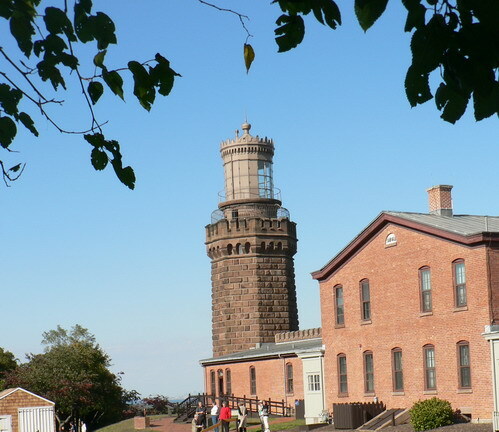 Unfortunately unless you can stand in mid-air or are in a helicopter or plane it's very difficult to get a photo of the entire lighthouse clearly. 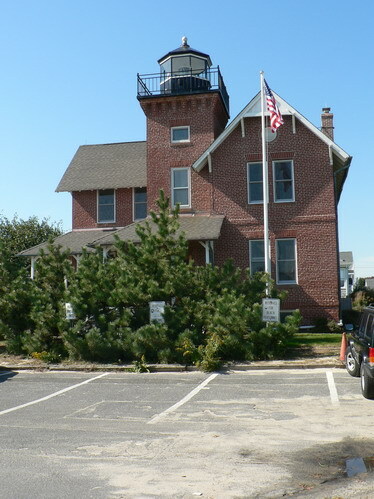 We had to park at the high school and walk over to the lighthouse. 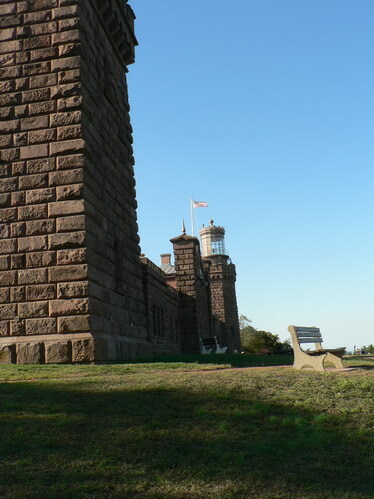 Here are different parts from different angles of the Twin Lights (Navesink) (Highlands) Lighthouse. 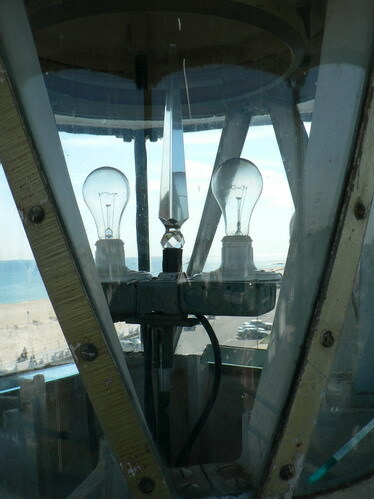 We went inside after walking around all sides of the lighthouse and took a look at the exhibits in the Museum. no photos are allowwed inside the Museum area. 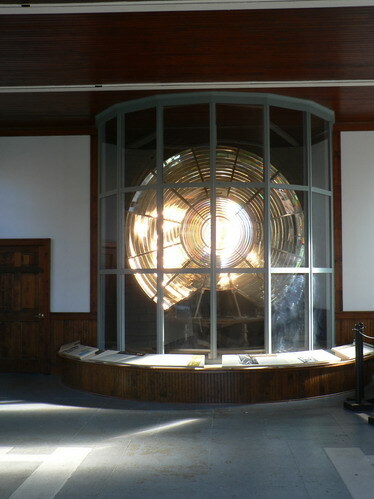 Here is the Fresnel Lens that used to be in one of the towers of Navesink. 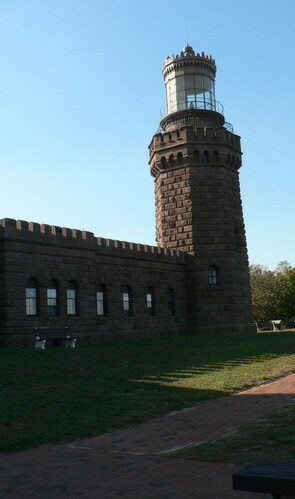 We took our leave of the 2010 NJ Lighthouse Challenge at this point and drove home stoping along the way for dinner. The weather was very good for the Challenge again this year. The 2009 NJLHS Lighthouse Challenge was the only one that had bad weather on both days of the challenge- including the roads to East point being flooded and the volunteers out past the flooding giving out the souvenirs. We had some cold and partially rainy days before that but mostly we were lucky- unlike say the Maryland challenge which had hurricanes come through at least twice during the Challenge. I don't recall- sorry. I've forgotten a good bit of the lore I've been exposed to over the past decade. I'll send an e-mail to Greg and ask him about it and get back to you. 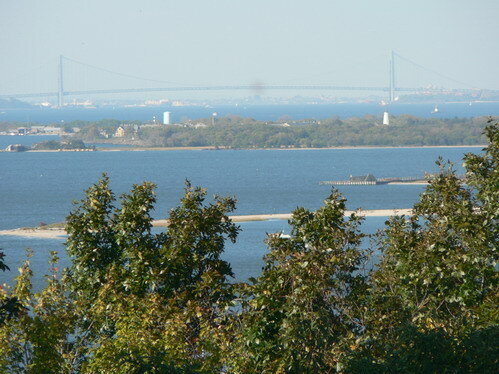 I could not even remember that the body of water next to the lighthouse was called the Wreck Pond. I remembered pond but couldn't recall the other part so I left it out of my description of the photo from the lantern room.